The Chinese yuan is struggling to find direction at the end of the trading week as investors comb through mixed economic reports. Because of the string of tariffs imposed on China, the world’s second-largest economy continues to experience the worst, including many of the nation’s sectors. And this, researchers say, could send its gross domestic product (GDP) lower. According to the China Association of Automobile Manufacturers (CAAM), wholesale deliveries of passenger vehicles tumbled 7.7% year-on-year in the third quarter, which is the worst quarterly performance in a decade. The auto sector suffered an immense 12% drop in September. Overall sales fell 9.1% in the July-to-September period, prompting dealerships to find additional spaces to store their growing inventories. For the last decade, auto sales contributed to surging economic growth, rising at an average of 14%. With the earnings report season well underway, analysts are discovering a troubling trend for Beijing: companies are preparing to relocate their supply chains from China to other markets. The cost of importing Chinese goods is becoming problematic for businesses because of the rising tariffs. Especially light manufacturing, factories move very quickly. A number of them have already moved out of China. They’re going to Vietnam. They’re going to Bangladesh. They’re going to Indonesia. And the product is still being made. It’s made or being made in other countries… to field the demand of the people who need the products. So overall, we’re very bullish about trade from Asia… but it might be coming from different countries, or different ports of origin. These factors might apply pressure on economic growth in the third-quarter. In a research report composed by Economic Information Daily, Xiamen University, and University of London, China is anticipated to record GDP growth between 6.58% and 6.64%, a decrease of 0.32% from the previous year. Next year, researchers project, GDP growth will slide to 6.48%. 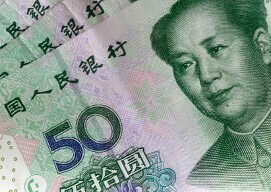 The USD/CNY currency pair slipped 0.02% to 6.9472, from an opening of 6.9489, at 15:45 GMT on Friday. The EUR/CNY rose 0.09% to 7.9077, from an opening of 7.9006.